If you’re a professional athlete or a leisurely swimmer, choosing the right swimwear and water sport accessories is very important. By choosing the accessories that are right for you, you are ensuring you’ll have the best possible workout, training session, or time spent relaxing in the water. Let’s look at some of the most popular water sport accessories for this summer! 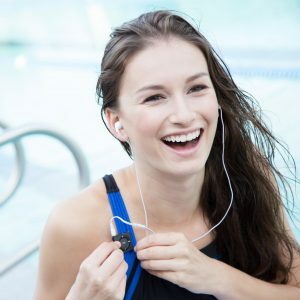 If I had to choose only one item out of every swim related accessory there is, I would, without a shadow of a doubt, choose Underwater Audio’s waterproof iPod. There are so many benefits of having a waterproof iPod. First, it is such a wonderful feeling to have your favorite song playing as you are training or working out, giving you the little extra push and motivation you may need to complete your session. There have been countless studies conducted on the benefits of music while working out. Music produces emotions, and emotions are an extremely powerful thing. Emotions are more than feelings; they’re a comprehensive brain-body response to events in our environment, which should facilitate our performance in – and interaction with – that environment. Sometimes you may feel like giving up while you’re working out, especially near the end of your exercise routine, when it gets difficult to finish. But if you have your favorite songs motivating you till the very end, you can not only complete your workout, but improve! Having the right bathing suit or swimwear makes all the difference in the world when it comes to working out in the pool. It matters even if you’re just going for a quick dip in the pool. If you’re exercising you need to be comfortable so you can focus all your energy on improving and getting the best workout you possibly can. The same goes for a casual swim in the pool. If you’re tugging or constantly adjusting your bathing suit it takes the fun out of your time with your friends. There are hundreds of brands to choose from. Some of the most popular and reputable brands known for their swimwear is Nike, Speedo, Rebok and Dolfin. They have bathing suits made especially for training in the water, but they also have more fashion friendly bathing suits too, while still being comfortable. There are many colors and styles to choose from! This summer when you hit the pool, don’t forget your favorite bathing suit and your waterproof iPod. What are some of your favorite water accessories? Tell us in the comment section below!